You are at:Home»The Foodie»Eating Out»London Restaurants»45 Jermyn St. Dining anywhere near the Piccadilly thoroughfare has been known to send a shiver down my spine, for some restaurants are hardly better than those grim ‘pile it low, sell it steep’ trattorias you find on the main piazzas of Italy. Shoddy service and expensive, dire food worthy of the trash can. 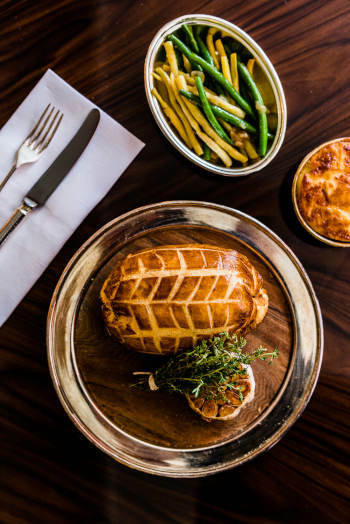 45 Jermyn St. is another matter, however, for despite being located on the corner of arguably London’s most prestigious department store, Fortnum and Mason, it’s a culinary world away from the Piccadilly tourist trap. With its own discreet revolving door entrance, enter the Mayfair of yesteryear, where the city’s all-knowing elite congregate at all hours for nourishment and reassuring elegance. From art afficiandos direct from the nearby Royal Academy, ladies fresh from a spot of Bond Street shopping or St James pinstripe-wearing business types keen to impress clients with an effortlessly chic lunch venue, 45 Jermyn St. is a hive of activity from breakfast through to late suppers and cocktails. One glance tells you that most of the diners have been here before, a true commendation when a restaurant has been open for a few years, and this most certainly isn’t the kind of crowd who would venture somewhere twice if their exacting standards weren’t satisfied. A glamorous, 1950s New York style interior with green walls and orange leather booths, come lunch time service expect a ripplingly vibrant ambiance with enthusiastic conversations, hearty laughter and a front of house kept on their toes like a corp de ballet. The long bar meanwhile encourages pre or post dinner drinks for those in no hurry, and 45 are serious enough about cocktails to make you linger. Whilst a glass of Champagne is usually my aperitif of choice, 45’s signature tipples, wittily named after the locale and associated characters, might just lead you astray. ‘Beau’s Negroni’, taking its name from Beau Brummell, the fashionable gent who invented modern menswear and is celebrated with a statue on Jermyn Street, features Hepple Gin, Cocchi di Torino, Mondino Amaro and Champagne, while ‘The Arlington’, a concoction of Pastis, cucumber, basil, yellow Chartreuse, lemon and Champagne, ticks all the boxes. If you’re here for breakfast or brunch, you’ll be glad to know that an entire page of the cocktail menu is devoted to Marys. Try the ‘Dirty Mary’ with tequila for the ultimate hair of the dog. 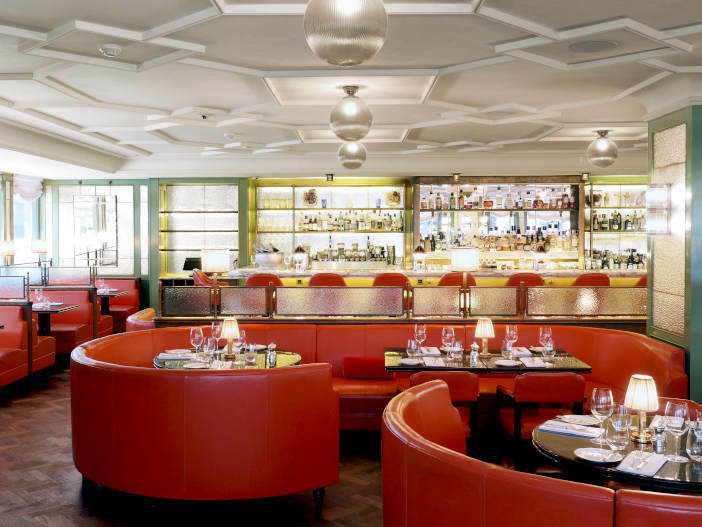 The menu meanwhile reinvigorates the high-end Mayfair brasserie concept we’ve become tired of, with enticingly quirky options such as the caviar trolley illustrating 45’s lighter side and oozing high roller sophistication. Stocked with all the accoutrements you could possibly need, blinis, new potatoes and scrambled eggs made table side, choose from Siberian Sturgeon, Golden Oscietra or Iranian Beluga 000. If you’re entertaining on an expense account your guest’s choice might just wipe the smile off your face. With diners dripping in Burlington Arcade diamonds and Patek Phillipes the sky’s the limit. When I learnt that the fresh Portland crab salad was a sell out, half a dozen River Yealm oysters saw me right, as did a taste of my companion’s burrata with radicchio and black truffle honey. Divine. Dover sole à la Meunière was as good an example as you’ll find in London; the butter caper sauce served on the side and our waitress filleting to perfection. 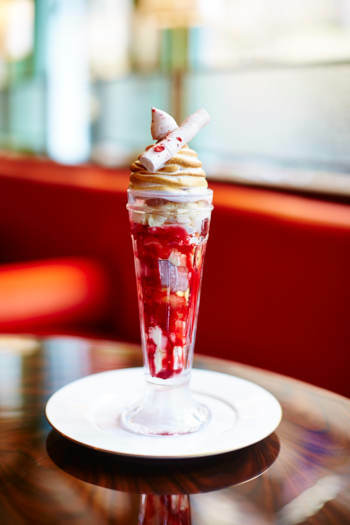 Desserts, known here as ‘Afters’ are frivolous, just as they should be, with a tempting array of ice cream coupes and floats such as cornflake ice cream, brown butter syrup and Four Roses Bourbon, along with that old favourite the Knickerbocker Glory, something a certain Paddington Bear once enjoyed when once he could pronounce it. My banana soufflé was only marginally more grown up, and appeared standing proud, bearing a melting disc of ’45’ embossed chocolate, with a layer of caramelised banana beneath a fluffy cloud and a side of peanut butter ice cream to dunk with immature glee. There is nothing serious about this restaurant other than the quality of the food and service, for what makes you return to 45 Jermyn St. is the lightheartedness that jumps out of the imaginatively composed menu and into the aura of the dining room, guaranteeing guests leave with a spring in their step as they toddle past Beau Brummell and doff their hat. 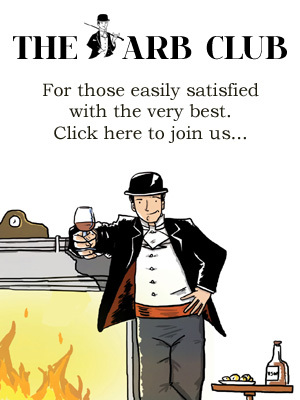 If Brummell could only shake off the bronze holding him back and magic himself to life he’d surely reserve a table in the window, his napkin tucked into his shirt collar and cravat in readiness of the Prince Regent and the caviar trolley. 45 Jermyn St, St. James’s London, SW1 6DN. For more information and reservations please visit the website.